Ten years ago, a driver ran a stop sign as Jim McIlroy rode into the intersection on his motorcycle. Serious injuries left McIlroy paralyzed from the chest down. But, after spending some time in a nursing home, he returned to his home near Bethel, Maine. McIlroy does most of his own cooking since Maine’s Medicaid program paid for a stovetop that he can roll his wheelchair underneath to reach the food-prep area. His new kitchen sink has the same feature. Wheelchair-friendly wood flooring has replaced McIlroy’s wall-to-wall carpeting. WASHINGTON/NEW YORK (Reuters) – U.S. President Donald Trump on Monday took aim at the nation’s health insurers in an escalating threat to cut the healthcare subsidy payments that make Obamacare plans affordable, one day after urging Republican senators to continue working to undo his Democratic predecessor’s healthcare law. LONDON (Reuters) – AstraZeneca hired two senior scientists to bolster its cancer drug work on Monday, signaling confidence in its oncology portfolio despite last week’s big setback in a lung cancer clinical trial. Kim was most recently at the U.S. Food and Drug Administration (FDA), where he worked on the evaluation and regulation of medicines for a variety of cancers. WASHINGTON (Reuters) – U.S. President Donald Trump and members of his administration on Sunday goaded Republican senators to stick with trying to pass a healthcare bill, after the lawmakers failed spectacularly last week to muster the votes to end Obamacare. For the second day running, the Republican president tweeted his impatience with Congress’ inability to deliver on his party’s seven-year promise to replace the Affordable Care Act, President Barack Obama’s signature healthcare bill commonly known as Obamacare. Members of his administration took to the airwaves to try to compel lawmakers to take action. WASHINGTON (Reuters) – U.S. President Donald Trump threatened on Saturday to end government payments to health insurers if Congress does not pass a new healthcare bill and goaded them to not abandon their seven-year quest to replace the Obamacare law. The tweet came a day after Senate Republicans failed to muster enough votes to repeal parts of the Affordable Care Act, President Barack Obama’s signature healthcare bill commonly known as Obamacare. After the Senate fell short in its effort to repeal the Affordable Care Act, the Trump administration is poised to use its regulatory powers to accomplish what lawmakers could not: shrink Medicaid. President Donald Trump’s top health officials could engineer lower enrollment in the state-federal health insurance program by approving applications from several GOP-controlled states eager to control fast-rising Medicaid budgets. Indiana, Arkansas, Kentucky, Arizona and Wisconsin are seeking the administration’s permission to require adult enrollees to work, submit to drug testing and demand that some of their poorest recipients pay monthly premiums or get barred from the program. Note that this randomized trial found that a combination of financial incentives plus telephone-based coaching had a modest effect on increasing step counts among those after total knee replacement. It is not clear how the increase in step counts translates into functional or long-term outcomes. Health coaching by telephone integrated with financial incentives led to an increase in physical activity in patients following total knee replacement (TKR) for osteoarthritis (OA). Normally in this spot, we highlight a single finding from a recent study. This time around, we thought we’d take a different tack. We dug into the 2016 National Health Interview Survey — 805 questions asked of 33,000 Americans — and in particular the data on pain. 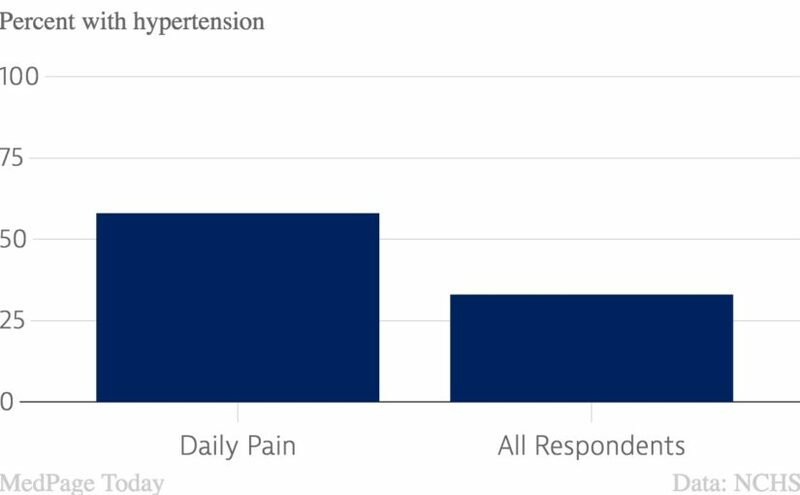 Nearly 1 in 7 respondents last year reported they felt pain every single day in the past six months. While the current wisdom is that pain is overtreated, we thought it would be worth taking a closer look at other ways this fairly large group differs from other respondents. This story was originally published on July 18. After a week of high drama, culminating in a one-vote loss for a last-ditch bill, Senate Republicans conceded defeat early Friday morning in their seven-year push to “repeal and replace” the Affordable Care Act. This story was originally published on July 24.